124 Pages. A single copy of the Winter 2015 issue of the PWC Newsletter featuring the 2015 National Specialty, including 105 pages of color specialty coverage and ads. Chronological color coverage of the National Specialty, “Cowabunga!” includes an overview of the week-long event by Show Chair Marlene Rosenberg. Informative articles covering the Performance and Companion events follow, with Ellen Gerwin covering the Herding Trial, Gina Femali reporting on the Tracking Tests, and Mary Matejcek reporting on the Agility, Obedience and Rally trials. National Coverage includes photo collages of all the events, beginning with a report on the Welcome Party, which featured a bagpipe tribute to the memory of Art Smith, to whom this specialty was dedicated. Other event coverage includes the Banquet and Silent Auction. Critiques and collages are provided for Puppy and Veteran Sweepstakes, Regular and Non-Regular Classes and Junior Showmanship. A memorial tribute to Art Smith and a report on the Peer Education seminar on improving fertility and whelping outcomes given by Dr. Marty Greer rounds out the specialty coverage. Ann Marie Buonanno, DVM’s report on the biennial AKC Canine Health Foundation National Parent Club Canine Health Conference contains information on degenerative myelopathy, epilepsy and osteosarcomas. 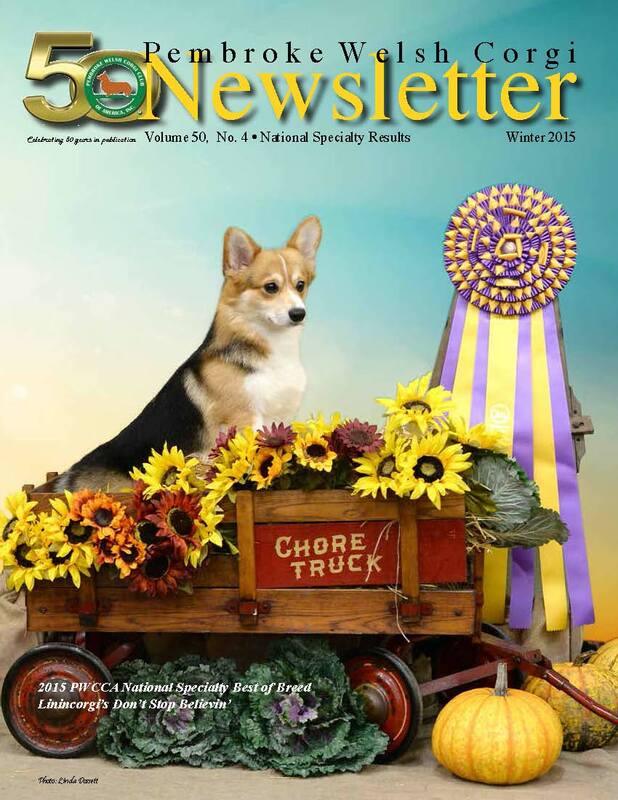 The Regional Talebearers reports include a Spotlight on the Columbia River Pembroke Welsh Corgi Club with photos. Calendar of Events, PWCCA Business information, Regular Editors’ Columns and color and b/w ads featuring PWCs. Available only as long as supplies last.